Starting with the Copperhead, Razer equipped most mice with onboard memory. Using this memory you can store specific key bindings and DPI settings directly on the mouse, which allows you plug it in a different computer, without drivers for the mouse, and still enjoy most of the special button binds. A very important feature for LAN gamers who play tournaments. Razer really gets this part about gaming mice, and the Imperator does it just as well as the other memory-equipped Razer mice. The Imperator is Razer’s 4th mouse to use a Philips TwinEye laser sensor. The first mouse to use the TwinEye was a disaster (my Razer Lachesis review). The Razer Orichi bluetooth mouse uses the same sensor, but it has newer firmware and is supposedly better. 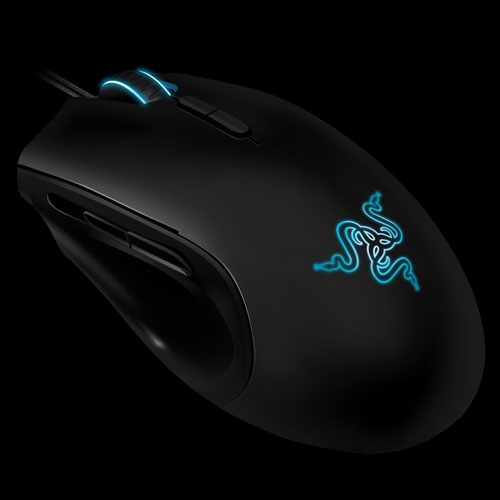 The Razer Mamba has a newer 5600DPI sensor, which is identical to the one used in the Razer Imperator. The mouse will move diagonally when you pick it up and put it back down again. Like in a game, you’re chasing a target, reposition the mouse, but after putting the mouse down the crosshair is not where you’d expect it to be. It’s just a little bit off. In the case of the Lachesis, it also meant that clicking the mouse on a soft mousepad would make the cursor move, even though you didn’t move the mouse. The light tilt caused by the press of a button made the cursor move by a few pixels. This problem is still present in the Imperator, but it’s greatly reduced., only when you press the mouse buttons really hard. Sometimes after repositioning the mouse one of the mouse directions (up-down, left-right) will not work for a split second. Think rocket jumping in Quake or TF2: a quick flick of the wrist, you fire a rocket, and you end up facing some weird way, messing up your jump. Laser sensors still have some annoying issues tracking on certain surfaces, especially cloth. This can turn a smooth diagonal movement into a staircase-like line. I’ve encountered no tracking errors on the Razer Exactmat (white) and Razer Destructor (black), but had a few on the Razer Goliathus. Kinda annoying on the desktop when trying to click a small button. Shape-wise it’s obviously inspired (to put it mildly) by the Logitech MX5** series. If you like the MX500 shape, you’ll like the Razer Imperator. It’s slightly lower, which allows me to use it with palm grip and finger tip grip. Finger tip grip wasn’t comfortable for me on the MX500 shaped Logitech mice. thumb up, thumb down, left, middle, right, middle up, middle down. 7 well placed buttons. I use 5 of them, because I can’t be bothered to set up the middle up/middle down buttons to do something different than change DPI. The left and right mouse buttons are slightly harder to press compared to the Diamondback and Deathadder, but not as hard to press as the MX518. The scrollwheel has a nice click when you roll it and is easy to press down. I considered this to be a stupid gimmick, much like the weights present on mice a few years back, but I actually quite like the adjustable thumb buttons. They allow you to perfectly place the thumb buttons for your hand. So if you use a palm grip, you place them further away from your wrist, and with a finger tip grip you’ll probably move them a bit closer. Changing the position of the buttons is quick and easy and after moving them the buttons feel just as the normal non-movable buttons. Playing for a while with the Imperator I’ve come to the conclusion that technically it’s no match for the Deathadder. The Deathadder’s sensor is simply better suited for every surface I’ve tried. Shape-wise however the Imperator is better for me. This causes a dilemma, better sensor vs better shape. For now the Imperator’s better shape outweighs the better sensor of the Deathadder, during the coming weeks I’ll try to make a definite decision about which mouse I’ll keep using. So the ultimate verdict: Would I recommend it? In its current form, no. Just like the original Deathadder, there are too many issues with tracking. I hope that, like the Deathadder, future firmware upgrades will fix the issues with the sensor so I can really enjoy this mouse. Out of my regular group of gaming friends, 8 out of 10 use a Razer mouse. 6 of those are Deathadders, all bought after trying mine on LANs. I wouldn’t recommend them upgrading to the Imperator just yet. Haven’t seen this happen during my gaming sessions, but sometimes after leaving the mouse alone for a while, the lights are off, scrollwheel doesn’t glow and the cursor won’t move. Buttons still work and a few seconds after clicking, the mouse will come back to life. Weird. This entry was posted in Hardware and tagged avago, boomslang, deathadder, imperator, infrared, lachesis, laser, mamba, razer, sensor, viper by Arie. Bookmark the permalink. Unfortunately, none of them are waterproof and/or make coffee. Good job on the review, i have one coming on Monday so i will have to see if these problems are deal breakers for me. Kind of bummed out to read about so many of them. I see that you are a moderator over at razer blueprints, i have been trying to make an account but the activation email will never go through, tried different emails and tried to resend it. I even tried the “contact us” feature but with no reply. I’ve activated all yet-unactivated accounts, please let me know if you can login to RazerBlueprints now. – How does it feel in your hand weight wise? About the same as the Deathadder or lighter/heavier? It feels just a tad lighter. – And what kind of tracking errors did you experience on the Goliathus (Speed or Control?)? I remember the Lachesis being much more accurate on cloth pads than any other laser mouse (starting from Copperhead/G5 to G9 and even up to G9x and SteelSeries Xai), which all have/had lots of jitter on cloth pads. After being a long time cloth pad user I have finally changed over to a glass pad, so it’s not such an issue anymore for me, but it would still be interesting as up to date no single laser mouse works really well on cloth (either jitter/tracking errors or jumps because of z-axis tracking). Inconsistent speed on the Goliathus. Mouse seems to slow down while I think I’m moving at the same speed..
– Do you think that it has this dynamic dpi algorithm which is used in the latest Mamba firmware to reduce z-axis induced problems? I can imagine that this would give a horrible tracking quality especially for very slow or tiny moves. As I’m using a hard pad right now I wouldn’t care about z-axis too much anymore but I definately wouldn’t buy the Imperator if it had dynamic dpi scaling. Dynamic DPI scaling might explain what I thought were tracking errors on the Goliathus. I’ll investigate again tonight. Thank you Arie, i can finally log in to razer blueprints. Just tested the Goliathus again, and this time it was absolutely fine. I got my imperator early, and unfortunately after a simple 30 minute session with the mouse it is in the box ready to be shipped out for a return tomorrow. I cant stand the z axis movement, it makes the mouse unusable for me. If i pick up the mouse and set it back down exactly where it was the cursor will 100% always move a large distance diagonally down and right. I thought i was setting it down at an angle or something but no matter what angle i set the imperator down the cursor or crosshair will always move down and to the right. If i tapped the imperator up and down off the mouse pad to magnify the problem the cursor wanders to the bottom right of the screen very quickly. Right now as i am typing this i can tap my G500 all day and it will not drift at all, just a tiny rebounding up and down movement but the cursor never wanders like it does with the imperator. Another problem was that the cursor would jitter or dance around as you clicked any of the buttons. I tried this on my talent and my 4HD thinking the problem would be solved with a harder surface but the cursor still danced around. The lift off distance is really not that low on my puretrak talent, it is identical to my G500, they both wont track at two DVD’s high but will track with one. Just thought i would share my disappointments here for those to be weary of. 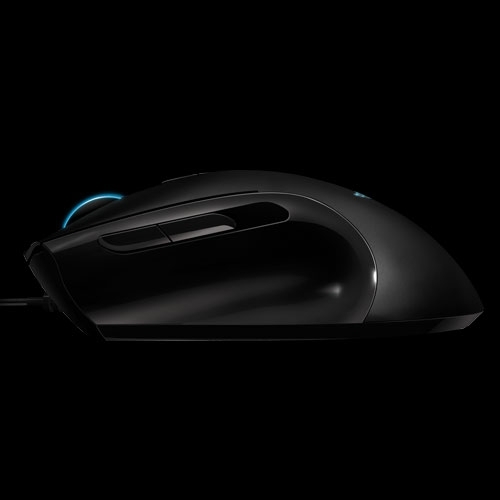 If razer somehow released a firmware to fix the z axis tracking and the click jitter then this would be a perfect mouse for me. But i am personally not willing to set a $70 mouse on the shelf and patiently wait for razer to release firmware updates to fix problems that might not even be fixable with the phillips twin eye sensor. Axis lock, the reason why I switched back to my DA right now. I ran into axis locking like 1 out of 3 swipes of my mouse. Especially when I do 2 quick swipes after one other. To bad though, before the DA I used a MX518. They’re both a tad to big for my hands (but it’s ok), the imperator on the other hand was just perfect. I’ve written a small update at the bottom of my review. Well I hope they can just somehow fix the axis lockups, if they do that the mouse is fine for me but until then I’m sticking with the DA. Aside from that the sensor is by far the most accurate one I ever had. I send them a support ticket explaining the axis lockups, I’m wondering if they’ll respond. 1. Try plugging the device into a different USB port on the system. If the device is plugged into a USB port on the front of the system, try a USB port in the back. 2. Disconnect all other USB devices. 3. Remove any USB Hubs. Plug the device directly into a USB on the system. 4. Try the product on another system, without using any drivers. Does the problem still occur? 5. If the problem is occurring in an application, does the problem occur outside the application directly in the operating system? Please refer to case #:: 400937654 if you have any further questions. If you need further assistance, you can also reach us online at http://support.razerzone.com. Please include all previous replies when/if responding to this message. the mouse often no longer responds directly when putting it back down. about half to a full second. My mousepad is a clothpad, Steelseries Qck Heavy. Well that’s unsurprisingly completely useless. So which is the DA to get right now? Original, or new sensor? I have the Imperator and I believe that the ergonomics of it outweighs the Deathadder’s tracking ONLY if you use claw/finger gripping. I have tried claw and finger gripping in both mice and I have to say claw and finger doesn’t feel as good on the DA. However, if you are a palmer, you might as well stick with the DA. The tracking is still great IMO on the Imperator and the z-axis issue really isn’t a problem. I play CS 1.6 (and perhaps soon Promod) and I honestly do not need to lift the mouse. I use a Destructor pad and to get an idea of my sensitivity, a flick of my wrist to the right is about a 90 degree turn in-game. If i needed to make a 180 degree turn, I would just move my arm rather than my wrist, so I do not need to lift my mouse. If there was a time I would need to life my mouse (when I need to reposition my mouse to the center), the way you reposition your mouse will not have any z-axis problems. Z-axis problems only occur when you lift the mouse a certain way. This certain way will never be used in-game IMO. I was thinking of getting the deathadder, but all I see is the new 3500 version. Why is the 1800dpi version better? The new one has jitter on cloth pads. apart from jitter on cloth pads, how does the 1800dpi deathadder compare to the 3500 deathadder? I’ve manually activated your account. hi Arie,i currently have a copperhead and i’ve been looking forward to buy razer imperator.would you reccomend it switching from copperhead to imperator.but after reading your review,i think its between deadadder or imperator..so how?copperhead vs imperator/deathadder which better? would you by any chance have a solution? I’m afraid I don’t. If you don’t need advanced button bindings, you won’t need them. I too as above currently have a copperhead but feel like a change and the only change who be for ergonomics i.e. imperator but the problems do worry me a little. Some ppl say it is bad some ppl (like the guy who plays CS 1.6) says it isn’t really an issue. So why not get the ‘old’ Deathadder? I have thought about it but it’s the ergonomics that is attracting me to the imperator. I don’t think I would buy a new mouse to buy the previous deathadder seeing as I have a copperhead. You’ve used the imperator for a while now? Is it a problem? I only play FPS games, I do lift my mouse up a little to re-adjust but not often but the mentioning of jocket jumping (I play a lot of TFC and L4d) kinda worries me for playing tfc. I REALLY want the imperator just these ‘problems’ are putting me off as it stands. I don’t see what’s wrong with the mouse, I think it’s pretty good. Moreover, the I don’t experience any problems with the axis. I suggest you get the Imperator cus it’s inclined to ergonomic. If you are the Jack-of -all-trades, you will be a master of none. I think the axis problem you face is probably the way you lift the mouse, or there may be a defect in it. Nothing is perfect, and razer can’t accomodate the world’s population’s needs into one mouse anyway. Every person has their own likes, don’t buy the deathadder and hate the imperator because a majority of your friends use it. Who knows, the person that might own you in a game might only be using a cheap, dinosaur-age ball mouse? It’s all about skill, the mouse is only a, like razer says, “an extension of your right hand”. I’m sure Razer will come out a solution and fix it(Which they probably hanve done so by now) if more people inform them about the problem, they can’t possibly create a patch just because of a handful of people. Razer is not going to fix this. Every mouse using a Phillips twin-eye sensor has this problem. Because of this problem I’m not recommending the Imperator to anyone. The old Deathadder and MX518 are great alternatives at less than half the cost. I’ve ordered an Imperator and Razer have released a firmware update that supposedly fixes the lift off issue. I will let ppl know how I find it. OK – just got it. First day granted have to get used to it but…. Not a good first impression tbh. HOWEVER, this may change from the firmware update, which I installed but in the software it still shows as the default firmware not 1.13 as I installed. anyone else got this? or any thoughts? With my copperhead you had to hold down the reset button then select the firmware u wanted. This seemed to just be an install jobby like drivers. If I reinstall the firmware it asks me if I want to modify, repair or remove the firmware which suggests it is installed properly but as I say the software still shows the default. Well – I’ve sent it back for a full refund. I might buy it again in the future. But reports were that the firmware update didn’t do a lot anyway and I’m not sure the shape (logitech style) was for me. Maybe I’ve had my Copperhead for too long but I think I will stick with that (at least for now). I’m from the Netherlands too, and I’m using a Razer Copperhead right now. But it’s about to break down, the tracking is horrible at my QcK+ mousepad. Is The Imperator a better mouse then a well functioning Copperhead? Or is a Deathadder 3500 (or even a Deathadder 1800DPI) a better buy? I don’t like the small amount of buttons on those Deathadders, I use at least 6 mousebuttons when playing shooters. The Imperator and Copperhead are kinda different. The Copperhead is much smaller in your hand than the Imperator, more nimble. The best buy is still the 1800DPI Deathadder IMO. Cheap, great tracking, but you’ll have to live with not having 6 buttons. Better tracking, higher maximum speed and higher resolution at the cost of z-asix tracking. They’re quite easy to press. I’d say about the same as on my old MX518. this mouse have the jitter problem? No jitter problem. There is an annoying ‘acceleration’ problem, usually referred to as ‘dynamic dpi scaling’. If you like to have no acceleration, stay away from this mouse. It is not clear for me, did they solve the imperator lift-off issue in fw v1.13? Does the mouse have dynamic dpi scaling or not? Edit: current imperator fw version is 1.15, realeased october. The Imperator has dynamic DPI scaling (all firmwares) to counter jitter. This is my main reason for not using it for gaming. Razer made an attempt to fix the liftoff, but they only half succeeded. It only fixes the z-axis tracking some of the time. Then I’ll squeeze a few more months out of my Copperhead and wait for a presumably better next generation. I am thinking about buying a razer mouse for gaming.. I play Starcraft 2 and League of Legends, but not competitively. What should I get? I do not care about the size of the mouse because I can adjust quickly.